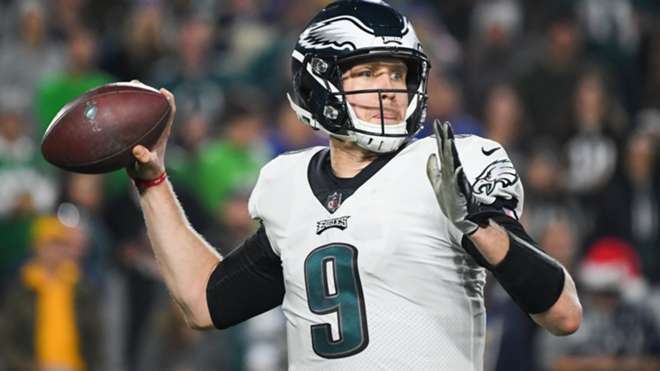 Quarterback Nick Foles has informed the Eagles he is voiding his $20 million option for 2019, after the team notified him it would be picking up the option, a source told ESPN’s Adam Schefter. The franchise tag number for quarterbacks is expected to be around $25 million for next season. The Eagles have publicly committed to Carson Wentz as their starting QB moving forward. By placing the franchise tag on Foles, they would have an opportunity to receive compensation for Foles via trade while having a say on where he ends up. The price for Foles is expected to be around a third-round pick, according to Schefter. If he voids the contract, Foles, 30, can enter free agency unless the Eagles block him by using the franchise tag on the backup quarterback. On Saturday, ESPN’s Adam Schefter reported that the Eagles were expected to use their franchise tag on Foles and then have the ability to trade him. Other teams reportedly inquired about Foles’s “price,” which is expected to possibly be a third-round pick. Last year, Foles led the Eagles to the franchise’s first Super Bowl win after starter Carson Wentz tore his left ACL in December. This season, Foles threw for 1,413 yards, seven touchdowns and four interceptions.